Formely known as Xara LX, it is based on Xara Xtreme for Windows, which is the fastest graphics program available, period. The Xara Xtreme source code was made available open-source in early 2006, and is being ported to Linux. This process is almost complete and Xara Xtreme for Linux is available for download now. Is very fast, very slick to use. 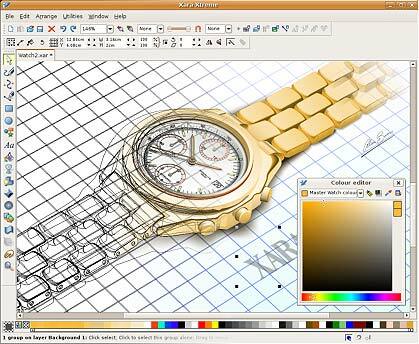 Offers some of the most powerful graphics tools available. Is simple to use and learn. Has a clean, un-cluttered user interface. Few floating dialogs, palettes, menus etc. Is able to create a huge range of outstanding graphics. Has a huge resource of learning material, tutorials, movies, tips and a very active enthusiastic and growing user community. "Xara LX promises to be the most important gift from the proprietary world to free software since OpenOffice.org." "Could Xara Xtreme become the StarOffice/OpenOffice.org of the graphics world? We wonâ€™t be betting against it." "With its amazing speed, small size, reasonable system requirements, moderate price and powerful feature set, itâ€™s hard to go wrong with Xara Xtreme. Xaraâ€™s recent announcements to make Xtreme open source and to develop Mac and Linux version should only make this excellent product even better." Years of tutorials for beginners and advanced users. Featured artists and a lot more. Our loyal, enthusiastic users are usually happy to help or answer any question. A large collection of useful tips.